Your partner could be yelling, crying, giving you the silent treatment, or criticizing everything around them. Why? Some hurt, sadness, or fear inside is pushing at them and you know it because they’re having big reactions. Then their behaviour or they themselves provoke you. Their tantrum turns into an argument between you. In fact, you may only realize “hey, my partner is having a temper tantrum” after your argument begins. How do you get yourself and hopefully your partner out of this mess? You need the magic potion of Self. You alone can stop the conflict happening in your relationship. How? Love your partner, the person behind the behaviour they are showing up in. In Internal Family Systems (IFS) language, we’d say your partner has been hijacked by a part of themselves, but their Self is still there for you to love. Your partner is not that yelling, crying, or criticizing behaviour. That behaviour is only a reactive part of them that will eventually settle down. Remember who your partner is, and you’re on the way to ending conflict. Loving our partners when they behave badly can be hard but what’s harder is not reacting to their bad behaviour. Having a strong reaction when your beloved husband, wife, or significant other is behaving in an extreme way makes a lot of sense. Unfortunately, adding your own reaction is like adding fuel to a fire. Maybe you start crying too or yelling. Those are big reactions that show up outside of us. A big reaction on the inside is withdrawing and distancing ourselves from our partner. Be sure to look for this! Withdrawing is sneaky because it doesn’t look like a reaction, but it is. #3 Before giving the magic potion of Self to your partner, drink up! You can use this potion for yourself and share it with others too. We all have these qualities of Self. All the time. If we’re not feeling them, it’s because we are blocked by a strong reaction in ourselves. In IFS language we’d say we’re blocked by a triggered or reactive part. Before you can show up in Self with your partner, you need to check in with yourself first (look at the steps in that post). Give yourself some Calm and Compassion. It’s hard right now when the person you love is not really all there for you. At least you can be there for yourself right now. What might you need right now? Get Curious. Take a timeout and see if you can meet your needs in real time before being with your partner. Having trouble bringing Calm? Read this blog post. Not sure how to be Self Compassionate in this situation? Read this blog post. What about Curious? There’s a blog post for that too. Or try this one. And here’s how to feel Connection on the inside. Start by doing the opposite of what you usually do. If you’re a do-er who tends to jump in and argue, instead bring in Compassion and Connection. If you are a distancer, then stay, being Calm and Compassionate. Get Curious about how hard it is right now for your partner. Remind yourself of who your partner is behind this bad behaviour. Love the person behind the adult temper tantrum. Love them in a way that feels kind to them. What works for children works for adults. Here’s an example. The other day I was spending time with an energetic and happy two year-old when someone took his seat inside the big playground fire truck. So what happened when this fun-loving little guy lost his seat? He cried and got really mad. He was headed to a full-blown meltdown and didn’t like anybody at all! “No” was his favorite word. When I went to him and ignored his (socially) bad behaviours but paid attention to him, he actually got worse before he got better. How sad that someone took your seat. I am sorry you feel so bad. He cried really hard and loud for about 30 seconds. Then the sun came out and we found a different solution together. Our loud, reactive parts will just get louder and louder the more we ignore them. Give them some attention and they’ll relax back. Just like my little friend. Sometimes a timeout is leaving the room. Sometimes it’s saying, “I’d like to discuss this topic with you but right now I’m not able to fully concentrate. I can talk with you later today or tomorrow.” Set a time to be available and be there. I highly recommend taking a You-Turn and then a Return. Take care of yourself by recognizing this is hard right now. What can you do to be kind to yourself while you’re in this situation? Do it. When you feel better and more balanced you can go back to the discussion and bring your Self energy to your partner as well as the discussion. Love your partner behind the difficult reactions. Know they are there and this too shall pass. Of course, if your partner’s behaviour is dangerous then remove yourself and don’t interact at all. Staying and interacting with dangerous words or behaviour is not taking good care of yourself. Take good care of you too! 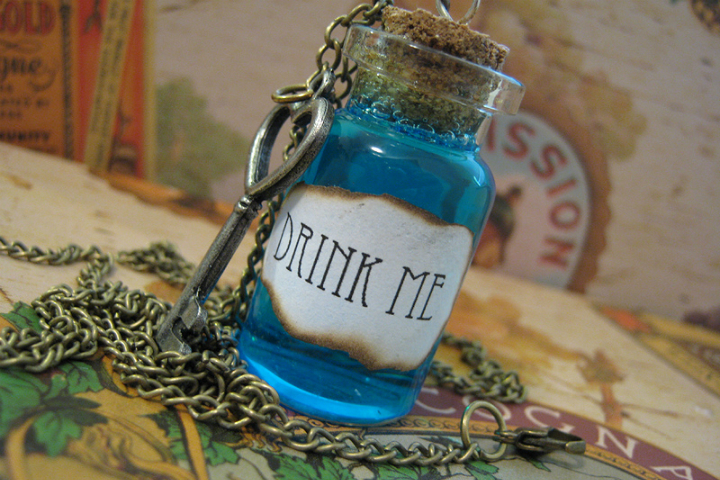 “Drink Me” by Flickr user Shannon O’Saurus is licensed under CC BY-ND 2.0. Share the post "The 5-Step Cure for Adult Temper Tantrums and Fights"